YummyInTheCity: Chop't Salads - Are we in Disneyland? Chop't Salads - Are we in Disneyland? From the size of the line and the way it wrapped several times in the Times Square location yesterday, for a moment I was a bit confused. Who knew that salad could inspire lines reminiscent of Space Mountain! 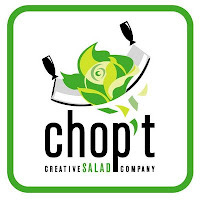 Chop't specializes in fresh, creative salad mixes that are mixed and chopped before your eyes! No one likes eating a huge piece of lettuce - so at Chop't, everything is chopped into that perfect bite. Salad creations include decadent options like the Chop't Po Boy (fried chicken, jack cheese, red onions, tomatoes and tex mex ranch - it has a kick!) and the Kebab Salad (grilled chicken, feta cheese, red onions, peppers, and pita chips chop’t with romaine lettuce) and the Steakhouse (Grilled flank steak, tomato, and fried onions chop’t with romaine lettuce). Or...make your own salad from dozens of toppings! In any event, Chop't will run you around $9-11 bucks for a salad. Pretty pricey for lunch - better make it a once a week treat! Maybe on a Friday when you can take a little bit of a longer lunch. Given the lines...you'll need it! P.S. Pick up a loyalty card - after 9 salads, you get one free! That's like 10% off!